Sleep Number 360 Smart Bed Review: Is it the Best of 2019? There is reason to be excited about the new Sleep Number 360 smart bed. From wearables to tracking apps, the momentum of the Internet of Things (IoT) has been revolutionary. However, with the exception of a few small upstarts, bed technology has remained largely unchanged. Though you can now order a bed off the Internet and have it delivered to your door in a box, bedding materials are the same as they've always been -- memory foam, coils, and maybe latex. So, when Select Comfort, the brand that changed everything with their Sleep Number mattress, announced the new Sleep Number 360 during CES 2017, we were very excited. Read on to learn what the bed promises, what the experts are saying about the technology, and how this could be a gamechanger for your comfort. The main promise of the Sleep Number 360 is that "when you go to sleep, the bed goes to work." This happens in four separate ways during the night. Self-adjusting comfort throughout the night - As you sleep, the bed responds to your movements by adjusting the pressure to allow for the perfect contouring from back to side sleeping, alleviating pressure points. This is the perfect combination for folks that sleep in multiple positions. 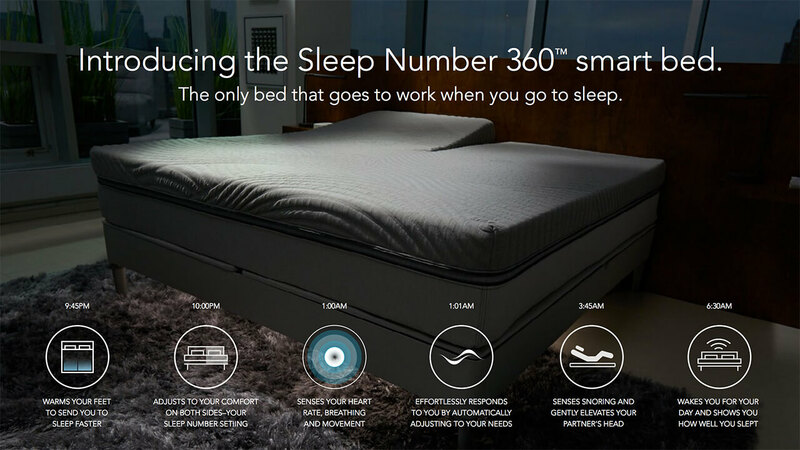 Automatic snore detection and adjustment - The 360 smart bed connects to your phone and collects information about your sleep in its proprietary SleepIQ application. By collecting this data, the bed is able to act when someone is snoring and adjust the bed by inclining 7 degrees, alleviating snoring. Foot warming and temperature control - The Sleep Number warms the foot of the bed at bedtime, creating a cozy feeling so that sleepers can fall asleep faster. Smart Alarm Feature - The Sleep Number 360 tracks the moment when you are in the lightest stage of sleep to awaken you based on your desired time so that you wake when you'd like, but without any groggy feeling. There is no doubt, that this bed has a 'wow factor' that many beds today simply don't have. There are other smart beds out there, like the Eight mattress, but this is the first major entry by a large mattress brand. As Sleep Number and others hone their products, more mattress tech could be a default for all of us. It is always exciting to see the beginning of something big, and smart beds could be just that! Nick Summers from Engadget noted that the bed he was going to try was out of commission due to a broken Bluetooth connection. Yet, he also said it was an intriguing product. Ashley Carman from the Verge said the bed "brings everything together" and that "it does a lot." One of the most in depth reviews from PCMag's Victoria Song detailed how comfortable the bed was even though it had a memory foam base. Although she noticed the snoring adjustment in tests, she thought it could have been 'stealth' enough so as to be unnoticeable while sleeping.